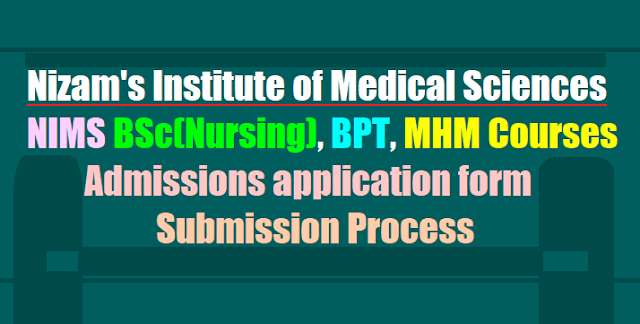 NIMS BSc(Nursing), BPT, MHM Courses Admissions application form filling instructions 2017, How to fill the NIMS BSc(Nursing) Course admissions application form, NIMS BPT Course admissions application form 2017, NIMS MHM Course application form 2017. NIMS has issued BSc(Nursing), BPT, MHM Courses Admission notification and applications are invited from eligible candidates of Telangana and Andhra Pradesh States for admission into B.Sc. (Nursing) Course, Bachelor of Physiotherapy (BPT) Course and Master in Hospital Management (MHM) Course for the year 2017. 2. A candidate must submit hard copy of the application form. 3. The Application Form may be downloaded and filled appropriately. Please note that all the columns in the application form require to be filled in. Incomplete and hand‐written application forms are liable to be rejected. 4. The filled in application form will have to be printed, signed, attest a latest passport size photograph and sent to Associate Dean, Academic‐2, 2nd floor, Old OPD Block, Nizam’s Institute of Medical Sciences, Hyderabad 500 082 on or before 5.00 PM of 29‐07‐2017 along a) all the documents mentioned in the annexure I and (b) a demand draft/NIMS cash receipt (see para 5 below). 15‐07‐2017 to 29‐07‐2017 will have to be submitted simultaneously along with the filled‐in application. The candidate must write her name and the course applied for on the back side of the Bank Draft/NIMS cash receipt. Application fee is non‐refundable even if the application is summarily rejected. 6. The filled in applications received after the prescribed date and time shall not be considered. The Institute will not be responsible for non‐receipt of application or delay in postal transit. 7. An acknowledgement along with Registration Number will be sent to the respective candidate by Email after the Application is processed. 8. The applications of in‐service candidates should be forwarded by the appointing authority. Certificate in original from the Appointing Authority at the time of submission of application. 9. The in‐service candidates should have a minimum of five years regular service. Applications should be forwarded by the Head of the Institution. 10. All candidates who are employees in the States of Telangana and Andhra Pradesh, Central Government under takings, Public Sector Corporations, Local Bodies, Universities and other similar quasi‐public Institutions should submit their applications along with No Objection Certificate from the appointing authority. The selected candidates should submit relieving order along with original certificates at the time of admission.